Night Owl’s CAB-60POE is a 60 ft. PoE Extension Cable for Night Owl NVR systems (both 720P and 1080P). With PoE technology the system can utilize a standard Ethernet cable to run Video, Audio and Power on the same cable. Your video security system is only as good as its cabling, so you should be using the best cables for the job. Night Owl’s PoE Extension Cable lets you provide power to the camera and video/audio back to the NVR or your network, all without any of the usual signal loss caused by multiple connections. 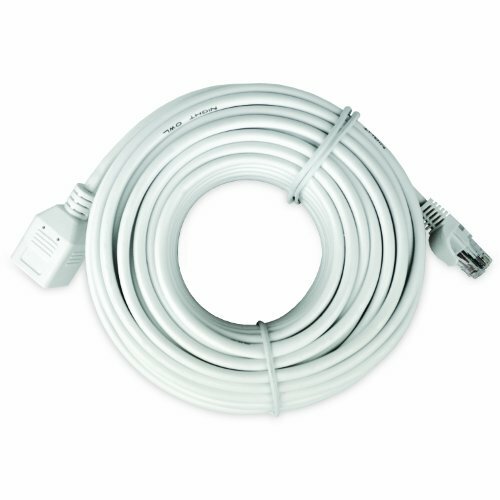 This cable comes with RJ-45 ends (female-to-male) to allow easy plug- and-play extension of your existing cable. The CAB-60POE is colored white and the cable is also branded with the word Night Owl, which aids our customer support specialists in pinpointing and troubleshooting any issues (they need to determine if any pre-existing cabling is being used). Key Features: 60 ft. of PoE Cable Female-to-Male Connectors Run Video, Audio and Power in one Cable Compatible with all Night Owl 720p and 1080p NVR systems. Cable Specifications: Length of Cable included 60 ft. Type of Cable: RJ45, CAT5. Connection Type: RJ45 8P8C JACK, Black Rubber Core, Gold-Plating FU, Ironclad/Nickel Plating, Left / Green light & Right / Yellow light. Customer Support 24/7, 365 Days a Year All Night Owl security products come with full technical support, 24/7, 365 days a year including Bilingual Help Desk. If needed, our Help Desk will also remotely access your DVR for setup assistance. If you have any questions about this product by Night Owl Security, contact us by completing and submitting the form below. If you are looking for a specif part number, please include it with your message.